In the early years of the Cold War, Berlin repeatedly became the focal point of tension between the U.S. and the USSR in the struggle for supremacy in Europe. Between 1945 and 1950, over 15 million people emigrated from Soviet-occupied eastern European countries to the West, which led Moscow and East Germany to tighten emigration controls. Berlin, administered by the four occupying powers, remained an escape hatch through which East Germans and others could flee. In 1958, Soviet Premier Nikita Khrushchev issued an ultimatum giving the Western powers six months to agree to withdraw from Berlin and make it a demilitarized city, which would then be turned over to East Germany. The West was vehemently opposed. The Paris Summit that was to resolve the Berlin question was cancelled in the fallout from Francis Gary Powers’ failed U-2 spy flight on May 1, 1960. Khrushchev then met with newly elected President John F. Kennedy in Vienna on June 4, 1961. Kennedy, however, was criticized for undermining his own bargaining position by essentially agreeing to the permanent division of Berlin. As tensions mounted, Kennedy called for an increase in draftees and funding for bomb shelters. The Eastern Bloc responded by erecting the Berlin Wall in August. Kempton B. Jenkins was posted to Embassy Moscow during this tense time and recounts Ambassador to the Soviet Union Llewellyn E. Thompson’s (aka “Tommy”) meetings with Soviet Foreign Minister Andrey Gromyko. 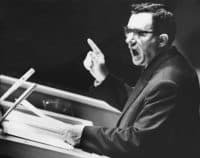 Jenkins notes how Gromyko’s composure radically changed from amicable diplomat to rabid warmonger who threatened the annihilation of New York. Jenkins was interviewed by Charles Stuart Kennedy beginning February 1995. Go here to read about when the Berlin Wall fell. 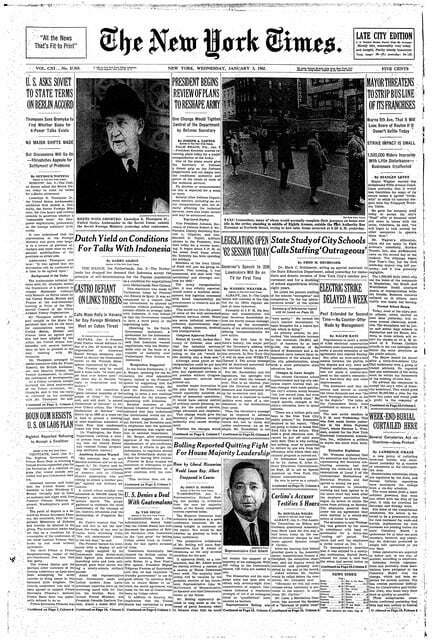 Read about Nikita Khrushchev’s ill-fated 1960 trip to the U.S. Read other Moments on the Cold War. 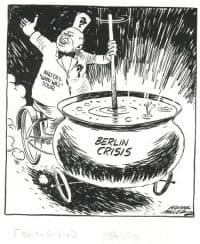 JENKINS: In the key period, in the winter of 1961 and ’62, I believe the confrontation in Berlin, the ultimatum having been raised, came down to “access.” So [Nikita] Khrushchev switched his target, and he insisted that we accept East German control of the access, which had been part of their focus from the beginning. Remember [President Eisenhower’s Secretary of State, John Foster] Dulles originally had this idea that we would accept East Germans as “agents of Moscow,” and legally our position would be unimpaired, he felt that way. I was “the Berlin man” in our embassy. We had these long cables come out from the Department with instructions. I would boil them down and interpret them for Tommy [Llewellyn E. Thompson]. They were replete with details. And, of course, I had lived in Berlin so I would get the instructions, and I’d work out a talking points paper for Tommy, and then the two of us would go in and meet [Soviet Foreign Minister Andrey] Gromyko. We had five meetings. They were all very high profile, reported in The New York Times on the front page. (My picture was on the front page of The New York Times with Tommy.) The first meeting we held agreed to have these consultations on Berlin access, which already made us nervous because we didn’t want to consult on something which was “a right.” But that’s what Kennedy insisted on. As we arrived at the first meeting, Gromyko received us in his outer office and escorted us into his little sitting room. Gromyko was extremely friendly. “Tommy, how’s Jane? How are your little girls? Is everything going well? I hope it’s not too uncomfortable. It is a difficult time for us, but it has always been a great pleasure for me to work with you professionally, because you are so professional.” He turned to me, and this was all in Russian even though Gromyko spoke beautiful English, and we chatted a little bit, and he complimented me on my Russian, and asked where I lived, where my apartment was, etc. [Soviet Ambassador at Large and Counselor to the Foreign Minister Vladimir] Semyonov was also friendly. They had a translator, Victor [Sukhodrev], who had been Khrushchev’s translator and subsequently became Gorbachev’s translator, he attended every meeting…. He had gone to school in Washington as a boy, and had very good English. We sat down and agreed that we would have another meeting the next week, and then we tabled our position, and they tabled theirs, we both agreed we’d study the positions and report back to our government. And we left. It was a very pleasant meeting, about 45 minutes. The second meeting took place about a week later. We had long instructions from Washington about what to present, etc. We walked in and Gromyko was absolutely a changed personality. He was cold, hostile, and unfriendly; he abruptly told us to sit down, and then launched into a 45-minute tirade about American irresponsibility and aggression, and lack of legal basis for being in Berlin at all, and how we’re going to do this, and we’re going to do that. And at one point he said, “You know, you’ve got to recognize that if you allow Berlin to become the flash point for a war, we will incinerate New York City in 24 hours.” That’s pretty heavy stuff. Tommy is sitting there on the couch, and I’m sitting on the couch next to him — Tommy was a chain smoker (eventually he died of lung cancer) and he’s smoking quietly. 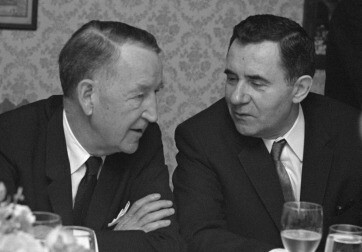 Gromyko (pictured with Amb. Thompson, at left) stopped. He gave this oration in a fairly high pitched voice; it was not a casual conversation. He was pounding on the coffee table. And Tommy just kept smoking, and there was silence. About 30 seconds went by, Tommy never said a word. And Tommy very quietly stubbed out his cigarette, and looked up at Gromyko, and said, “Oh, are you through, Mr. Minister?” It was a beautiful deflation. And of all the things I witnessed, that was the coolest diplomatic performance I ever saw. I was sitting there, my blood pressure was going up, of course, I didn’t open my mouth but I was taking notes. In these meetings I was the scribe, everything that they said, or that we said in response, I wrote down as best I could. And because it was first spoken in Russian, and I could understand the Russian, and then repeated in English, I was able to do it because I’d catch three-fourths of it, or half of it the first time, and fill it in the second round. And when we spoke, the same thing happened. Tommy spoke slowly and deliberately, but if I missed anything I got it in a Russian translation from Sukhodrev. And he stood up, and we left. Gromyko’s mouth was open. It was a dramatic performance. After each meeting, we would return to the residence and Tommy and I would sit down and review my notes. He was writing also on a pad, his interpretation of what was happening, and then I would review his notes. 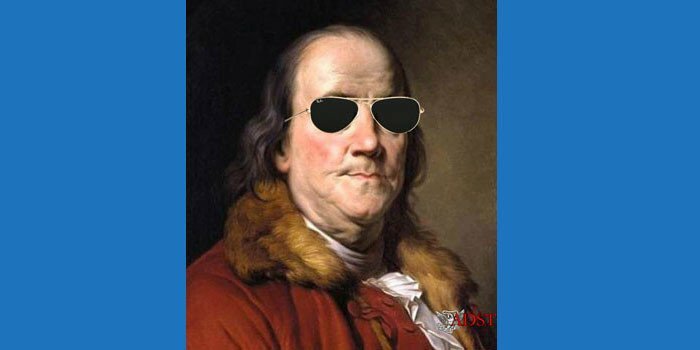 And I would make suggestions, and he would incorporate some of them, which was very heady stuff for a young diplomat, and then he would correct some of the things that I had done, or add an interpretative phrase. I would take the notes and go back to the embassy with a driver, which was about a mile away where we had two secretaries standing by. We’d go into the bubble [a secure room built within a room, in which members of the embassy could meet to discuss sensitive issues without fear of eavesdropping] and they would type up my verbatim account of the discussion, and Tommy’s interpretation. 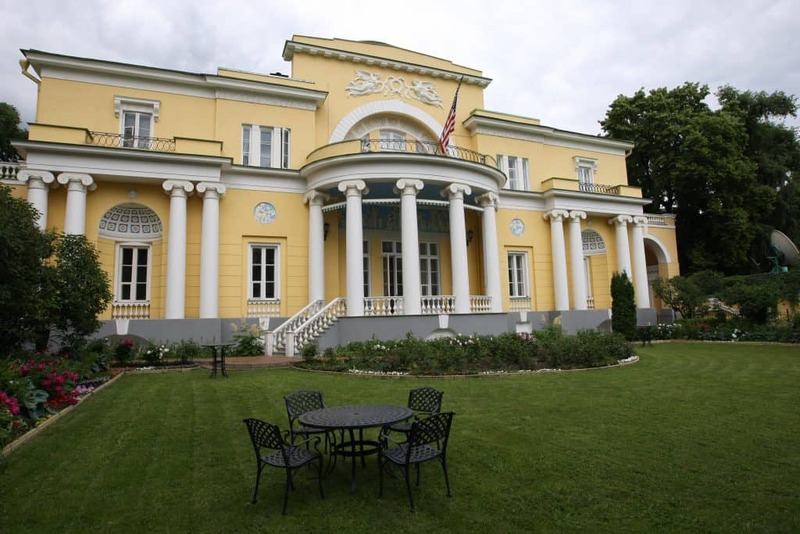 This would take maybe an hour, and then I would take those two papers, get back in the car and go back to Spaso [residence of the U.S. ambassador in Moscow]. This time we’d have a drink together, and Tommy would review them, and say, fine. He’d make a few changes here and there, I’d get back in the car, back to the embassy, and they’d go off Flash/Eyes Only [cable precedence] for the President and the Secretary of State. At first I was really nervous thinking, what the hell should I do and I decided, damn it, they’ll follow me closely and I’m probably going to be safer making this walk than any time in my life. It was very cold, this was in February, the snow was scrunching under my shoes, and I was invigorated and began thinking, God, this is great drama, and I’m in the middle of it and what a lucky fellow I am, and I’m making a contribution. I got to the embassy and we typed it up, then I got in my car and came back and we sent it out. But it was that one time, I never saw anybody, a little shadow here and there, but I know as I walked those blocks that within a half a block there were probably three or four people surrounding me with a security cocoon…. In Tommy’s interpretive telegram, he referred to [body language and expressions], and he characterized Gromyko’s performance as theatrical, dramatic, “staged,” and I think, as I recall…that it was another deliberate probe of our will, a deliberate attempt to intimidate…. The language that Gromyko delivered was reported verbatim practically. Tommy’s interpretation was also reported. Now, some people in Washington would dismiss Tommy’s interpretation and be paralyzed by the threat. The President, I believe, because he had developed this confidence in Tommy, and many other people, anybody who was witting and on top of it, realized that Tommy was the best interpreter that the United States had, and that his words were extremely weighty. I think that we helped stiffen the American spine by our interpretative comments. The reaction in policy terms in Washington is reassuring in that regard. But we knew that there were people back there saying, what are we doing in Berlin? We’ve got to get out of Berlin, this is crazy. We’re jeopardizing the United States’ security by this. Why are we there? This is a beachhead, we shouldn’t be there. Let’s withdraw. There are a lot of people going that way, and they were on both sides of the political aisle. You know, this bully is threatening me; we’ve got to stand up and whip him. So we always felt this was always in the balance, and the Russians clearly felt that way. They wouldn’t have gone through all this if they’d known for sure it was going to be counterproductive…. Those of us who had been in Berlin, especially me, I guess some people didn’t agree with me perhaps, always felt that World War III could start by miscalculation anywhere, but especially in Berlin. But that in terms of a calculated military engagement, there was no risk at all. Our real danger was to make sure that the Soviets didn’t misinterpret our anguish, intellectual approach, and messaging as weakness. But they did frequently, as we saw. Khrushchev in Vienna misinterpreted Kennedy’s performance as weakness. It was just his intellectual approach to things: they can’t be black and white. But in Berlin, one of the rare occasions in my career, it was pure black and white. And I reflected that and Tommy reflected that in his own very quiet way…. [When we left the meeting with Gromyko], we went out the door and said, we’ll report your views back to our government, we regret this was necessary, and we left. Now, Gromyko called us in for another meeting a week later, in the meantime we had another set of instructions, of course, which were very strong. We presented our instructions. The Russians rebutted them, and we went back to another round. We ended up with the Russians agreeing that there had to be a formulation. They essentially folded in front of our stern refusal to back down. They didn’t give up their theoretical position, but in terms of practice they agreed to stop harassing our access. There was a Quadripartite working group set up to consider access problems after that. But basically Khrushchev backed off, and that phase of the Berlin crisis ended. It was very exciting and Tommy was a real hero. It was the high point of my diplomatic career.